Our solution for a portable IV pole. Deane got an NG tube four days ago. It was a long day at the hospital. The nurse got the tube in in one try – the best anyone has managed it. Deane was his usual brave self. 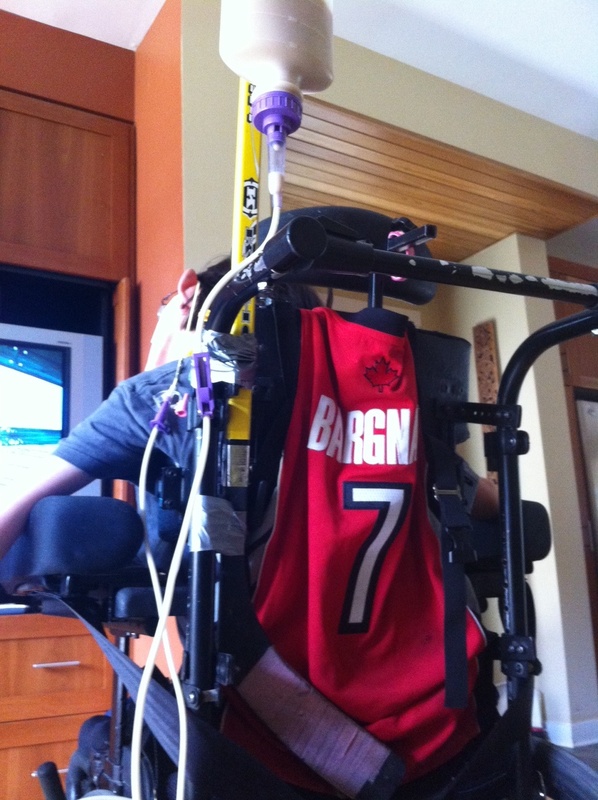 We came home without an IV pole so we found a truly Canadian solution – his sister’s first hockey stick duct taped to his wheelchair. With that solution, we are now trying to figure out how to implement the “feeding” plan. The plan includes afternoon and evening snacks of Boost meal replacements and equal amounts of water plus two 300 ml of water to keep him hydrated. All of this plus three meals. Today it wasn’t until 6 p.m. that Deane wasn’t ingesting something. I wonder how this will work when we actually have something to do during the day? I am unsure if we have met before. My name is Dustin D, I am Ossie and Patty’s cousin, but since I can remember I have always called them Aunt and Uncle. I believe I have came to your house before, when Uncle Ossie was taking James and I to a hockey game, (I think it was). I know this may seem a little random with everything I just explained in the beginning of this message, however, I have been following this blog via Ossie+Patties “share” on Facebook. I have never commented, but have always followed and read the blogs you have ever written since Deanes, what seem to me major procedure. I just wanted to comment on this blog, and express, how how much i admire, the strength, determination, love and support that shines through with every post that I read on your blogs. Deanes is beautiful child, and i could not imagine the struggles and barriers that not just Dean but yourself as a family overcome and conquer on a daily basis. I find each and everyone of your blogs as true inspiration and that love, hope, and as I said determination can conquer all. As you said in previous blogs, this sometimes just seems as the beginning, and that the road ahead is long and filled with many unknown factors, i personalty believe that with the love that is so clearly seen through your writing on these blogs, that Dean, yourself and your family will always come through smiling. It may sound a little weird coming from someone that you don’t know, but i just wanted to let you know that after I see these blogs, i truly feel inspired, and that every precious word, every precious thought, and every as the person, is truly inspirational and one of God’s gifts. Dean has already gone through more in his life than I’m sure I will ever have to go through and I’m nearly double his age. And for that reason, Dean has truly inspired me as a individual. In just about every picture I see of dean I see home smiling, which instantly brings a smile to my face. Even tho I do not know Dean personally, I believe I can still say, he is one of the strongest people I know. I look forward to reading more of your blogs as they are posted and follow &Dean and yourself through your journeys. Dustin, thank you for your very kind words. Some days I don’t feel as positive as you make us sound but Deane’s strength and determination are what keep us going. Thanks for your support. We couldn’t keep going if it weren’t for the love, kindness and prayers of so many people – even those we don’t know are pulling for us.